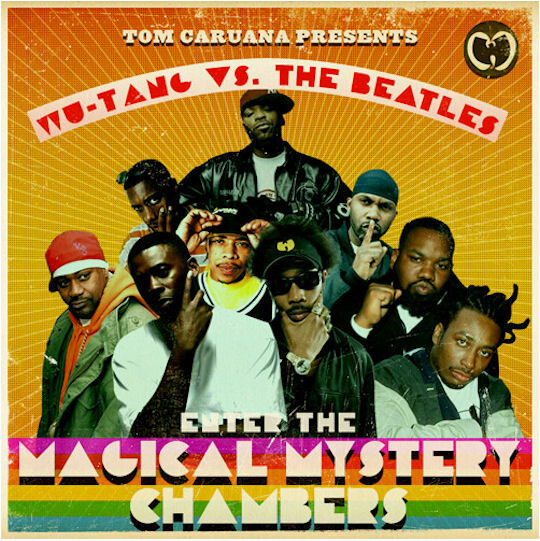 In this first mash-up, Enter the Magical Mystery Chambers, Wu-Tang Clan and Beatles works are combined to create a striking, and surprisingly seamless twenty seven track album. The Beatles classics you’ve heard your whole life are intertwined with smooth and steady Wu-Tang flows, bringing both works to another level of musical innovativeness. You listen to “C.R.E.A.M” rapped over an easy and peaceful orchestra, you hear “Yesterday” sampled as a background—the familiar words sped up, the vocals made high-pitched, and can’t help but smile at its brilliance; it works. The tracks themselves can stand alone, but the beauty really lies within the album as a whole—it just flows. It’s easy to listen to, you can hardly tell one track from the next, and the overall effect is chill, contemplative, and entertaining. You spend the majority of time loving the fact that it works, that the mix was even made, while listening to smooth lyrics and interviews (a girl hyperventilating while trying to explain her love of the Beatles, ODB talking about the Beatles’ influence on his music, him singing “Love Me Do“) woven into easy instrumentals. This album will definitely provide a nice background, and is 1.2 hours—just long enough to finish a subject that meets 4 times per week. These two are my favorites. And they are together. It’s great. The Grey Album is a mix of the Beatles’ The White Album and Jay-Z‘s The Black Album, and was the first Beatles hip-hop mash-up. It dropped in 2004, was named the best album of the year by Entertainment Weekly, and inspired controversy as the producer, Danger Mouse, did not get permission from the Beatles to reproduce their works. Unlike Enter, this album is more of a collection of individual tracks—the emphasis is really on the complete song versus how they all go together. “Justify My Thug” is definitely my favorite track, the twang of “Rocky Raccoon” is mixed nicely, and Jay-Z’s voice really stands out above the steady banjo; the contrast is good. “What More Can I Say” starts out well with a chopped up “While My Guitar Gently Weeps,” and although is it busy musically, the song works too. “Change Clothes” is also good with the opening “Piggies” sample, but again is busy musically. This album is overall more uptempo, and I wouldn’t recommend it as homework background, but more for it’s unique take on classic tracks. Year: Senior. Position: Editor. Fav Artist: I'm in love with ODB. Advice: Write good articles with links, and look over the Exeter Rap Association Stylebook (coming soon) if you have any questions. This entry was posted in Reviews and tagged danger mouse, enter the magical mystery chambers, jay-z, the beatles, the grey album, wu-tang. Bookmark the permalink. I’m glad you guys gave Danger Mouse some recognition here, considering he’s arguably the greatest living producer (Dr. Dre, I believe, is the only other valid choice). You should totally do a piece on ‘Dark Night of the Soul’, one of the best albums of last year despite the fact it never actually got released… even though, you know, it’s not exactly hip-hop. Also, though I appreciate the piece on Nomack, you should probably write something about Nujabes considering his recent death (RIP). Or, you know, if you totally want me to write one… (cough, cough, what?). Who do I see about writing for this blog? thanks for the suggestions! hope to get in contact with you. This is a great article. I’ve always loved The Grey Album, probably more than the black album. Y’all should check it out.